Adolescence is a period characterized by both increased susceptibility to risks and new-found strength to withstand them. Whilst most young people are well equipped to manage the changes associated with growing up, other maladjusted and marginalized adolescents already have, or are at risk of developing, mental health problems. Adolescent Mental Health: Prevention and Intervention is a concise and accessible overview of our current knowledge on effective treatment and prevention programs for young people with mental health problems. Whilst addressing some of the most common mental health issues among young people, such as behavioral problems and drug-related difficulties, it also offers a fuller understanding of the evidence-based treatment and prevention programs that are built upon what we know about how these behavioral and emotional problems develop and are sustained. The volume illustrates contemporary and empirically supported interventions and prevention efforts through a series of case studies. It has been fully updated in line with the latest NICE and DSM-V guidelines, and now includes an added chapter on implementation, and what factors facilitate implementation processes of intervention efforts. 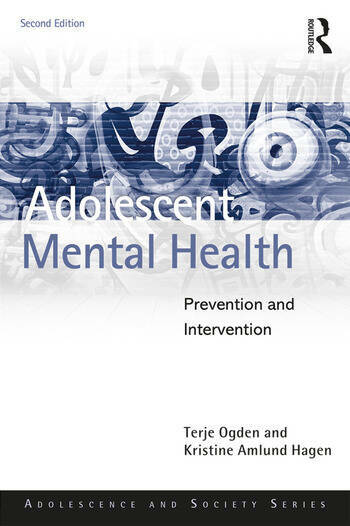 Adolescent Mental Health: Prevention and Intervention will be essential reading for students and practitioners in the fields of child welfare and mental health services, and any professional working with adolescents at risk of developing mental health problems. Terje Ogden, Ph.D., is research director at the Norwegian Center for Child Behavioral Development, Unirand and professor at the Institute of Psychology, University of Oslo, Norway. Kristine Amlund Hagen, Ph.D., is senior researcher at the Norwegian Center for Child Behavioral Development. Her research has focused on social competence, antisocial behavior, implementation of intervention efforts, and risk and protective factors.